GCP Applied Technologies is a leading global provider of construction products that include additives for cement and concrete. The company has presented a research paper on improving the quality of cement from vertical roller mills by reducing pre-hydration during the 25th ASEAN Federation of Cement Manufacturers Technical Symposium & Exhibition. The company also showcased two new cement additive ranges – the Tavero VM grinding aids and Opteva HE quality improvers. Compared with ball mills for cement production, vertical roller mills require a smaller plant footprint and offer greater energy efficiency and narrower cement particle size distribution. Cement produced in vertical roller mills, however, sometimes exhibits lower strengths and longer initial setting times as compared to ball-milled cements made with the same raw materials. Tavero VM grinding aid additives, which help stabilise vertical roller mills during production by reducing water injection requirements and cement pre-hydration. At the same time they improve cement performance by delivering higher strengths and shorter setting times. Opteva HE quality improvers are cement additives that provide options for gaining higher early (HE) strength and are particularly effective for challenging cements. GCP has more than 80 years of experience producing high quality grinding aids and performance enhancers. The company’s grinding aids have helped producers improve cement productivity by up to 20 percent without additional production costs. Similarly, GCP’s quality improvers have helped improve mill production by up to 20 percent, early and long-term compressive strength by up to 30 percent, and helped lower energy consumption by about 25 percent, all without any loss of cement quality. 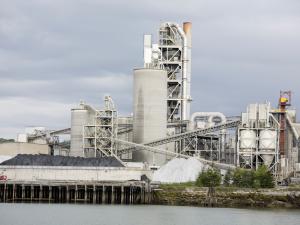 The company will continue to expand its comprehensive portfolio of additives for cement production under the Opteva and the Tavero brand with new products rolling out in the future. Image courtesy of GCP Applied Technologies.